What inspired you to begin your work in technology? What do you find exciting about your current roles? I travel the world working on dozens of different projects: neuroscience, cybernetics, AI, education, labor markets, diversity & equity, and more. The privilege of touching so many lives is more than I ever thought I'd achieve. Someone recently described me, in a bout of flattering exaggeration, as a "one woman Alphabet", with multiple companies and nonprofits solving problems in many different fields. At the highest level I work to maximize human potential, assuring the everyone's life story is filled with health, happiness, and impact. This ranges from writing books to studying the labor economics and AI to developing machine learning tools to support bipolar suffers. A principal focus of mine right now is maximising the life outcomes of young children by combining machine learning, learning sciences research, and simple text messages. One of the core tenets of science is that human intuition in not a guide to truth. We've developed sophisticated methodologies to actively challenge our own biases in the search for understanding, and yet we routinely let these same biases and limitations define our assessment of others. Discrimination is a tax that compounds over a career. It's root is in our inability to accurately value people who differ from societal norms and from ourselves. We need to stop "blaming" young women for not "leaning in". Stop instructing them to be more like men. The number one predictor that an exceptional young person goes into science, technology, or any other high-value field is the belief that they can do it too. Not simply that they are capable, but that they will be accepted. Specifically that means role models and active support. Cognitive neuroprosthetics -- I want to literally make smarter people. And yes, it is also the technology of which I'm most terrified. What areas of emerging technology do you think will have the biggest impact your field? Near term, the biggest impact will come from ubiquitous computing. Low cost, distributed sensor systems, from wearables to smart building, can transform the human experience. I am worried, however, that fights over platform ownership, data hoarding, and proprietary formats will hobble the emergence and value of these systems. We need a more open and pluralistic approach to data. What do you think the biggest barriers are for women entering the industry? How can we overcome these? 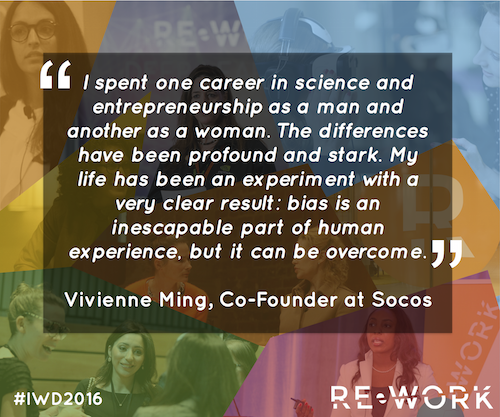 I spent one career in science and entrepreneurship as a man and another as a woman. The differences have been profound and stark. My life as been an experiment with a very clear result: bias is an inescapable part of human experience, but it can be overcome. What do you feel are the biggest challenges that the world faces today? How can technology and science solve them? There are many real, existential challenges we must solve. My own focus is equity -- globally and locally, race and gender, economic and political. But I’m not interested in settling for passive, undemanding equity. I want a world were we make an active effort fully realise everyone’s creative potential. Read the webcomic Saturday Morning Breakfast Cereal (generally) and the strip Many Lives (specifically). Take real risks with your lifetimes and please make those lives count. My own additional advice is to find your fanaticism -- that thing you do even when people tell you not to. That is your path to life and career success. It may not be somethings you “love” to do; it’s something you have to do. Pursue that Muse and good things will come to you.